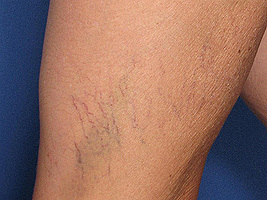 Precisely treat unsightly broken capillaries and spider veins close to the top of the skin. Avoid injections associated with sclerotherapy and the pain of “stripping”. The Sciton™ laser can treat all skin–tanned or darker pigmented skin–unlike other lasers. If you are interested in learning more about what our Laser Spider Vein Removal treatments, call 614-888-6833 today to schedule an appointment.